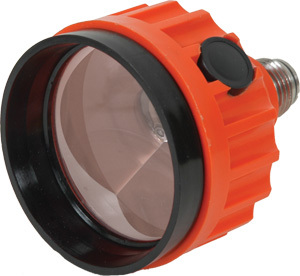 The Seco strobe prism is ideal for night time or any low-light job condition. Has a red LED that strobes every two seconds. Has a sealed prism canister with an M20 thread, which is standard for screw-in style canisters and fits all holders designed for screw-in style prisms. All electronics and the battery are securely built in to the canister. The battery — a Sanyo CR-1/3N — is the same used in many cameras and will function for approximately 48 hours before needing replacement.